• Observe the rules on off-road driving. • Do not drive at an angle on slopes, inclines or gradients, but instead follow the direct line of fall. The maximum gradient-climbing capability of your vehicle is 100%, which corresponds to an approach/departure angle of 45°. Note that the climbing ability of your vehicle depends on the terrain conditions. • Avoid high engine speeds. Drive at appropriate engine speeds (maximum 3000 rpm). • Check the brakes after prolonged off-road driving. Do not switch to transmission position N when driving off-road. If you try to brake the vehicle using the service brake, you could lose control of the vehicle. If the gradient is too steep for your vehicle, drive back down in reverse gear. 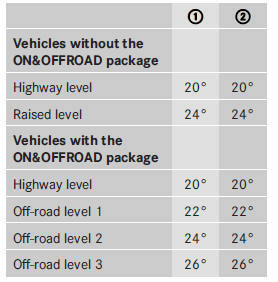 On good road surfaces the maximum gradient-climbing capability of your vehicle is 100%, which corresponds to an approach/ departure angle of 45°. 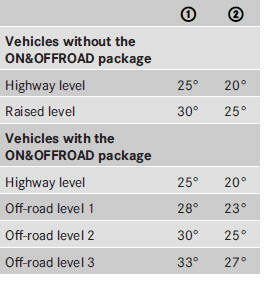 Note that the vehicle's gradient-climbing capability depends on the off-road conditions. 4ETS recognizes this and brakes the wheels accordingly. The rear wheel torque is increased, making it easier to drive off. When driving up an uphill gradient, slightly reduce pressure on the accelerator immediately before reaching the brow of the hill. Use the vehicle's own impetus to drive over the top of the hill. Otherwise, the vehicle could slip sideways, tip and rollover. • Activate DSR. If this is not sufficient, brake gently. When doing so, make sure that the vehicle is facing in the direction of the line of fall. The special off-road ABS setting enables a precise, brief and repeated locking of the front wheels. This causes them to dig into loose earth. Be aware that the front wheels easily skid across the ground surface if completely braked and therefore lose their ability to steer.